ODLs (yellow) bind to a site on the ribosome not used by other antibiotics. Location of this site is shown here relative to the sites of other known antibiotics, such as negamycin (green), tetracycline (dark blue), aminoglycoside antibiotic paromomycin (red) and streptomycin (light blue). Researchers from the University of Illinois at Chicago and Nosopharm, a biotechnology company based in Lyon, France, are part of an international team reporting on the discovery of a new class of antibiotics. The antibiotic, first identified by Nosopharm, is unique and promising on two fronts: its unconventional source and its distinct way of killing bacteria, both of which suggest the compound may be effective at treating drug-resistant or hard-to-treat bacterial infections. Called odilorhabdins, or ODLs, the antibiotics are produced by symbiotic bacteria found in soil-dwelling nematode worms that colonize insects for food. The bacteria help to kill the insect and, importantly, secrete the antibiotic to keep competing bacteria away. Until now, these nematode-associated bacteria and the antibiotics they make have been largely understudied. To identify the antibiotic, the Nosopharm research team screened 80 cultured strains of the bacteria for antimicrobial activity. They then isolated the active compounds, studied their chemical structures and engineered more potent derivatives. The study, published in Molecular Cell, describes the new antibiotic and, for the first time, how it works. UIC’s Alexander Mankin and Yury Polikanov are corresponding authors on the study and led the research on the antibiotic’s mechanism of action. 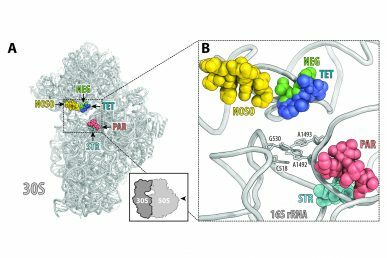 They found that ODLs act on the ribosome — the molecular machine of individual cells that makes the proteins it needs to function — of bacterial cells. 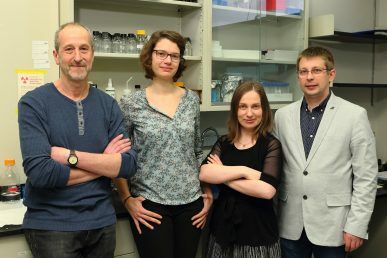 The UIC researchers, including graduate student Tanja Florin and postdoctoral research associate Malgorzata Dobosz-Bartoszek, also found that when bound to the ribosome, the antibiotic disrupts its ability to interpret and translate genetic code. While many antibiotics can slow bacterial growth, Mankin says antibiotics that actually kill bacteria, called bactericidal antibiotics, are rare. “The bactericidal mechanism of ODLs and the fact that they bind to a site on the ribosome not exploited by any known antibiotic are very strong indicators that ODLs have the potential to treat infections that are unresponsive to other antibiotics,” said Mankin, who is also professor of medicinal chemistry and pharmacognosy. According to the World Health Organization, antibiotic resistant is one of the biggest threats to global health today and a significant contributor to longer hospital stays, higher medical costs and increased mortality. In France, the Nosopharm researchers tested the ODL compounds against bacterial pathogens, including many known to develop resistance. “We found that the ODL compounds cured mice infected with several pathogenic bacteria and demonstrated activity against both Gram-negative and Gram-positive pathogens, notably including carbapenem-resistant Enterobacteriacae,” said co-corresponding author Maxime Gualtieri, co-founder and chief scientific officer of Nosopharm. Carbapenem-resistant Enterobacteriacae, or CRE, are a family of germs that have high levels of resistance to antibiotics — one study suggests that CRE, which are the common culprits in bloodstream and surgical site infections, contribute to death in up to 50 percent of patients who become infected. The researchers say this study is a testament to the growing trend of international and cross-disciplinary collaboration, which is needed to combat the growing and global threat of antibiotic resistance. “In this case, the combined expertise of the industry, which has the resources to develop new compounds, and the academia, which has the research and lab capabilities to understand how the compounds work, have enabled the development of this new class of antibiotics,” Mankin said. “The collaboration between multiple labs with diverse areas of expertise add credibility to the research,” Polikanov said. While ODLs have yet to be thoroughly investigated for their therapeutic potential, the researchers say that the study findings justify future research in this direction. “Collaborations with academia with renown expertise in antibiotics like the UIC team help us for this preclinical development,” said Philippe Villain-Guillot, co-founder and chief executive officer of Nosopharm. Collaborating on the research, which was funded by Nosopharm, are Lucile Pantel, Emilie Racine, Matthieu Sarciaux, Marine Serri, Jessica Houard and Andre Aumelas from Nosopharm; Jean-Marc Campagne, Renata Marcia de Figueiredo and Camille Midrier from the Institut Charles Gerhardt Montpellier in Montpellier, France; Sophie Gaudriault, Alain Givaudan and Anne Lanois from the Universite de Montpellier in Montpellier, France; Steve Forst from the University of Wisconsin in Milwaukee, Wisconsin; Christelle Cotteaux-Lautard and Jean-Michel Bolla from Aix-Marseille Universite in Marseille, France; Carina Vingsbo Lundberg from Statens Serum Institut in Copenhagen, Denmark; and Douglas Huseby and Diarmaid Hughes from Uppsala University in Uppsala, Sweden. More information on Nosopharm, which specializes in the research and development of new antimicrobial molecules, is available online.